The Sexuality Summer School brings postgraduates, researchers and international scholars together with artists and film makers. The summer school gave me the opportunity to deepen my understanding of the relation between sexuality and time in a supportive yet challenging learning environment. It offered an excellent opportunity to meet other postgraduate students and early career researchers working in the larger field of sexuality studies and queer theory. The summer school facilitates dialogue and discussions that speak to contemporary debates in queer and feminist sexuality studies. We also place a particular emphasis on the interdisciplinary study of culture. For more information about the Sexuality Summer School visit our blog, join our mailing list, or find us on Facebook and Twitter. The 11th annual Sexuality Summer School took place between 21 and 25 May 2018 and focused on the theme of 'Queer Longing'. The summer school took place at the School of Arts, Languages and Cultures Graduate School at The University of Manchester, with public events taking place at cultural and arts centres throughout the city of Manchester, including HOME and the Centre for Chinese Contemporary Art. Further information on events and speakers can be found on the Sexuality Summer School blog. See the programme for the 2018 Sexuality Summer School (21-25 May). You can find more information about the Sexuality Summer School, including a short film on what we do, on our blog. Brian Lobel and Liz Carr performance dialogue: Normality: What is it good for? "Anti-Gravitas: Queer Importance in Art and Performance"
"INTER*ME: Give me an L! G! B! T! I! Q! or How I Lived (Through) my Acronymous Identities"
Public lecture with writer and filmmaker Sarah Schulman (CUNY) - "Conflict is Not Abuse: Overstating Harm, Community Responsibility and the Duty of Repair"
In 2014, our focus was on cultural theories and histories of anatomy. The Sexuality Summer School also included workshops with Claudia Castañeda (Emerson), with Erika Alm and Kajsa Widegren (Gender Studies, Gothenburg) and members of CSSC at The University of Manchester, including: Jackie Stacey, Monica Pearl, David Alderson and Laura Doan. 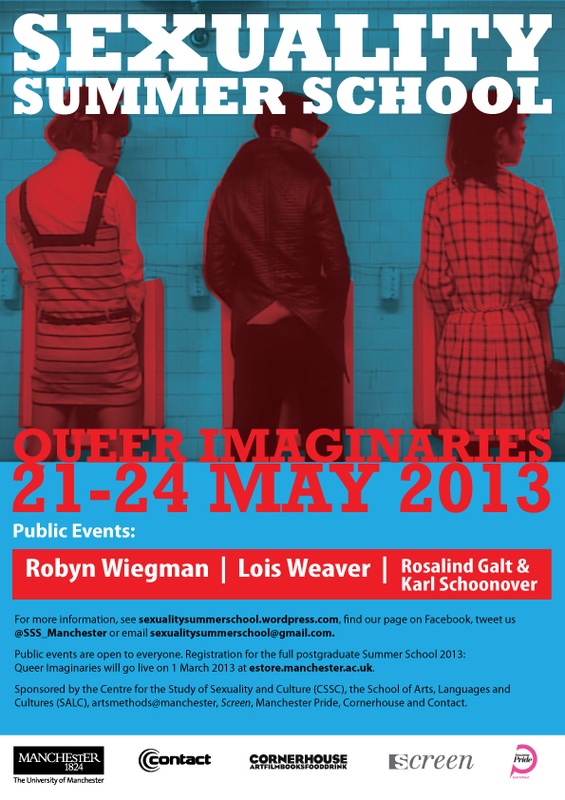 In Autumn 2013, the Centre for the Study of Sexuality and Culture at the University of Manchester held the 'Queer Now and Then' seminar series. Overseen by Professor Laura Doan, this set of events welcomes a number of scholars in order to explore queerness in relation to time and history. The 2012 Sexuality Summer School drew upon the success of its previous years, embracing an interactive learning model that combines intensive workshops, discussion panels, lectures and student-lead seminars in order to construct a supportive research community over the course of four days. This year the conference turned towards the idea of Homophobia and Other Aversions, bringing together researchers from diverse fields including English Studies, Cultural Studies, Sociology, Media Studies, Performance Studies and many others to discuss and critique representations and understandings of gender, sexuality and queerness as they relate to aversion. Speakers included Ann Cvetkovitch, Mary Cappello and Lois Weaver. Ann Cvetkovich is Garwood Centennial Professor of English and Professor of Women's and Gender Studies at the University of Texas at Austin. Her publication An Archive of Feelings: Trauma, Sexuality, and Lesbian Public Cultures (Duke, 2003) develops a queer approach to trauma, contending that the field of trauma studies, limited by too strict a division between the public and the private, has overlooked the experiences of women and queers. Mary Cappello is Professor of English at the University of Rhode Island and recently won a Guggenheim Fellowship in non-fiction. As a practitioner of literary non-fiction, Mary Cappello is primarily interested in creating forms of disruptive beauty, figuring memory in a postmodern age, bringing incompatible knowledges into the same space, and working at the borders of literary genres. Lois Weaver is Professor of Contemporary Performance Practice at Queen Mary, University of London. She is a lecturer, performance artist, writer, director and activist. She was co-founder of Spiderwoman Theatre, Split Britches Company and the WOW Theatre in New York and Artistic Director of Gay Sweatshop Theatre in London. The Sexuality Summer School is directed by Professor Jackie Stacey, with other CSSC staff members including Professor Laura Doan and Dr. Monica Pearl. Wednesday 23 May, 5.15pm, Kanaris Room, 2nd Floor, Manchester Museum. Lois Weaver: "A Long Table on Senses of Aversion"
Thursday 24 May, 5pm. Mary Cappello: "Vice Viscera"
Made possible by the University of Manchester Centre for Chinese Studies, the British Inter-university China Centre, the Ford Foundation, and the Queer China Working Group. Professor Lisa Rofel (University of California, Santa Cruz) interviews renowned queer Chinese activists Professor Li Yinhe (Chinese Academy of Social Sciences) and Professor Cui Zi’en (Beijing Film Academy) (interpretation services provided). 12 queer Chinese activists, academics and artists, including Professors Li and Cui, plus Professor Rofel and four Europe- and UK-based academics discuss the topic of ‘queer time and space’ as it relates to China (interpretation services provided). Notable queer Chinese documentary filmmakers Fan Popo and Xiaogang present and discuss their subtitled work (interpretation services provided), hosted by Cui Zi’en. The Sexuality Summer School 2011 drew upon the success of its previous years, embracing an interactive learning model that combines intensive workshops, discussion panels, lectures and student-lead seminars in order to construct a supportive research community over the course of four days. In 2011 the conference turned towards the idea of Queer Temporalities, bringing together researchers from diverse fields including English Studies, Cultural Studies, Sociology, Media Studies, Performance Studies and many others to discuss and critique representations and understandings of gender, sexuality and queerness as they relate to concepts and constructions of the temporal. The 2010 Sexuality Summer School's Public Lectures Series was in collaboration with Queer Up North and the Research Institute for Cosmopolitan Cultures. Colleagues from Manchester contributing to the Summer School include: David Alderson, Michael Bibler, Laura Doan, Adi Kuntsman, Kaye Mitchell, Monica Pearl, Jackie Stacey (coordinator). In collaboration with David Lomas (AHVS, The University of Manchester) and the AHRC-funded project on Surrealism and Sexuality. Queer theory has reshaped the study of sexuality for more than fifteen years now. The interventions of scholars such as Judith Butler, Eve Kosofsky Sedgwick, Judith Halberstam, Jonathan Dollimore, Lee Edelman and Jose Muñoz have queered debates about embodiment, desire, relationality, subjectivity, affect and representation in ways that have transformed our current understandings of cultural and political change. The 2008 Summer School addressed current debates within queer studies, emphasising in particular its implication for the interdisciplinary study of culture. It offered an opportunity for students to discuss queer debates with researchers in the Centre for the Study of Sexuality and Culture at The University of Manchester alongside attending events organised by the Queer up North International Festival 2008.